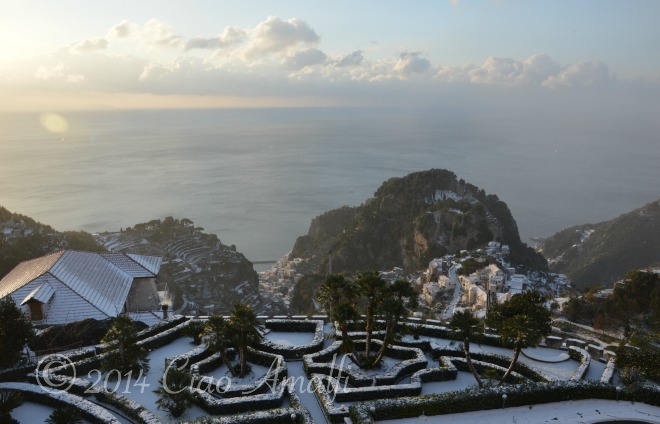 Snow on the Amalfi Coast! We woke up to the most beautiful surprise this morning. 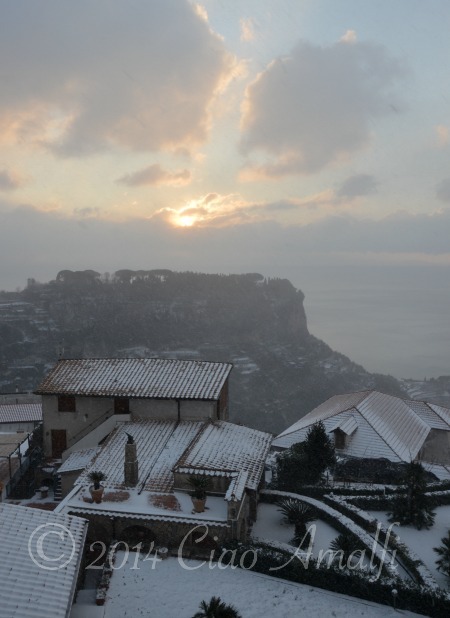 Snow on the Amalfi Coast! What an incredible way to remember the last day of 2014. While we occasionally get snow up in the mountains during the winter, I could tell this was a special snow. 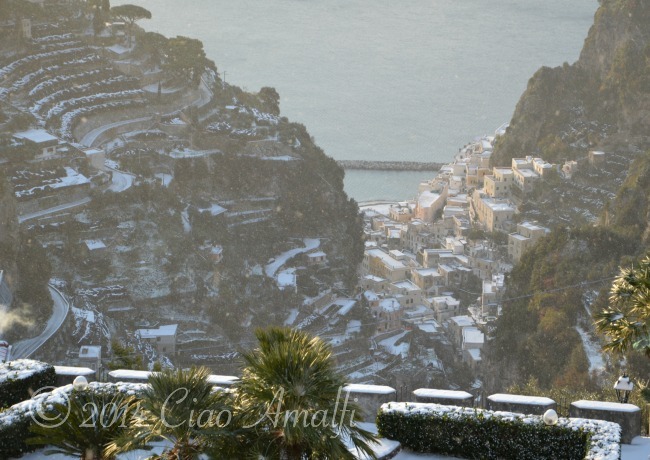 I could see snow on the beach in Atrani and snow by the red faro in Amalfi. This was really a snow! 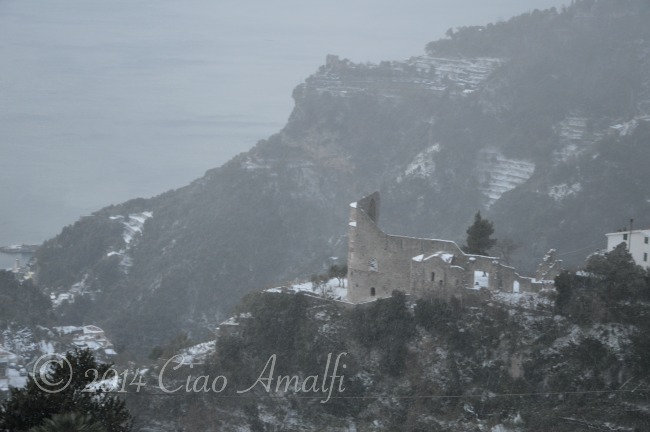 The ruins of the Church of Sant’ Eustachio in Scala had a dusting of snow and way down in Amalfi by the sea the bell tower of San Biagio was also white. In the photo below, far on the left, you’ll even see snow on the pier that juts out into the port. 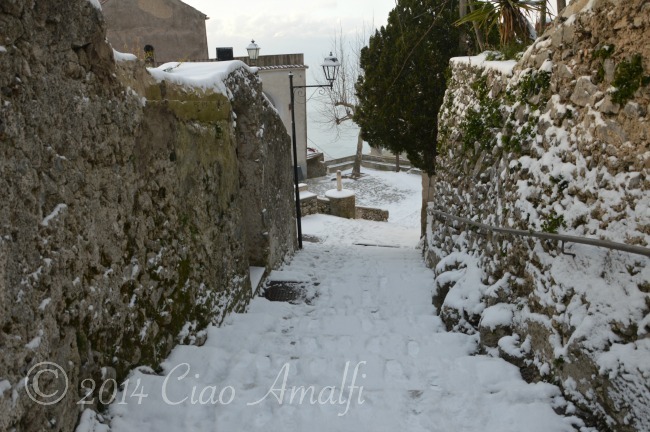 My husband says it has been about 30 years since there was snow on the beach in Amalfi! 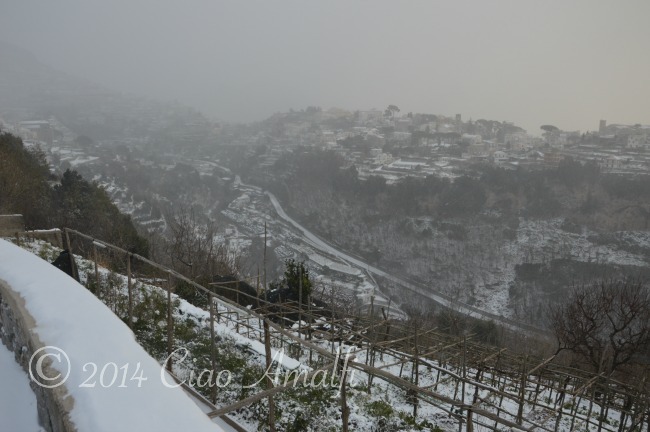 We watched the few brave drivers out slowly … very slowly … navigating the road down from Ravello. That’s a tough stretch of road even in good weather. I couldn’t imagine trying to drive that road this morning! 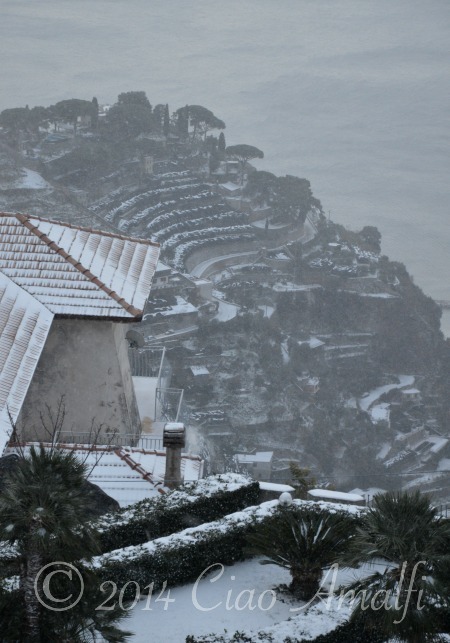 And if you look closely in the photo below you’ll see a snow covered beach in Atrani. It was still snowing when I took this photo and it wasn’t until after that I noticed the white beach. 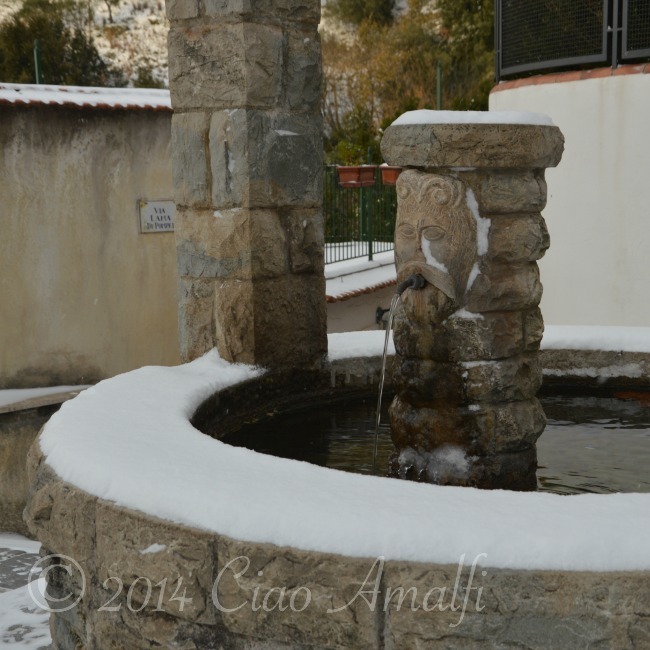 – Snow on the beach in Atrani! But I think the prettiest view of all was the snowy scene in Scala. 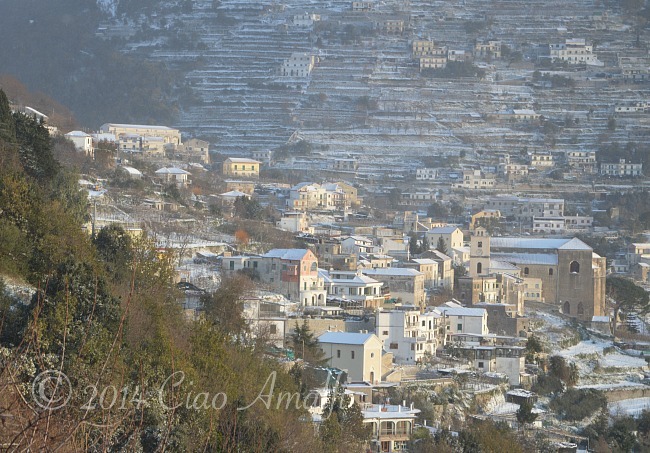 The snow-covered terraces on the mountains above the village created stripes as the backdrop to the winter scene. It was like a postcard winter setting! Of course I had to go out. I waited just a bit and thankfully there was a short break in the strong wind. It was still -3 C, but without the wind and bundled up it wasn’t too bad for a short walk. 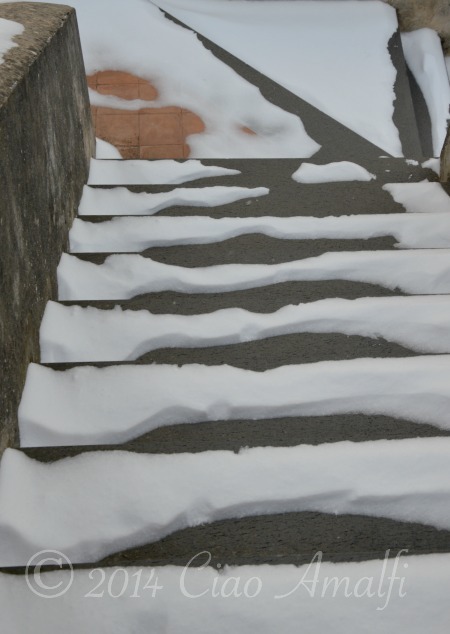 Crunching up and down the steps in the snow was a little more challenging than usual, but the beautiful view and quiet scenes were well worth the effort. I love the way a dusting of snow changes everything. I suppose that is especially the case in places where it doesn’t snow all that often like the Amalfi Coast. I couldn’t take many photos of the view across the valley to Ravello since a gust of wind arrived that nearly knocked me off my feet and set me crunching through the snow back home. 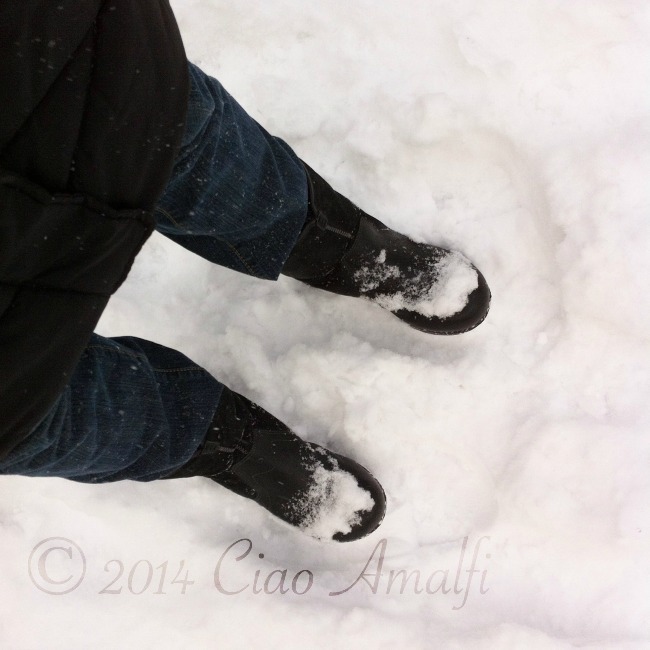 Winters on the Amalfi Coast require boots that are good for the rain and cold weather … and sometimes even the snow! Before going back inside I had one more mission … find Puffy! He’s one of our outside cats who spends the day inside. It took a few times calling him before he came out of hiding. He’s a smart cat though, and was completely dry. 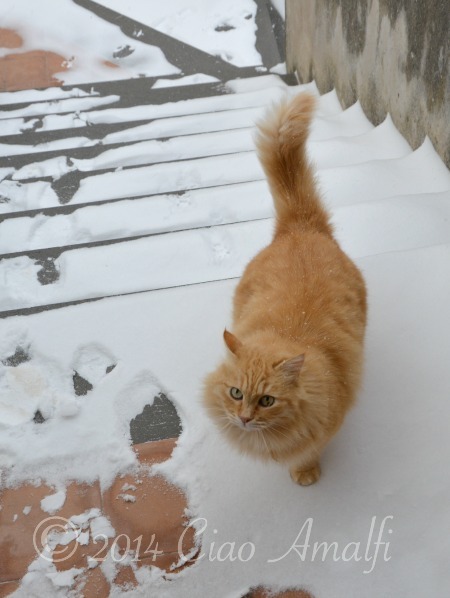 – Is there anything cuter than a fluffy orange cat in the snow? He was ready to come inside and warm up though! He’s all curled up and toasty now. 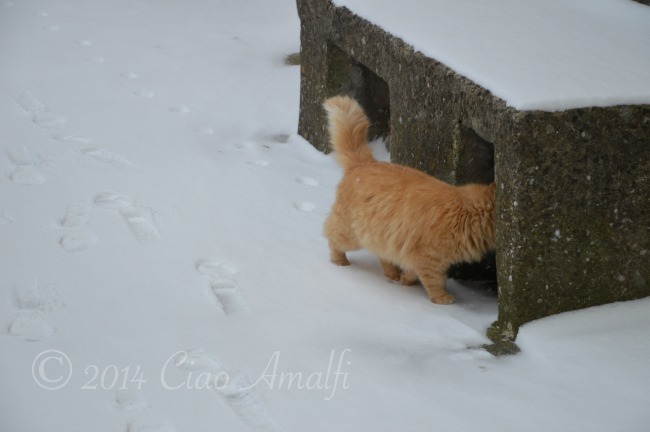 – Puffy in the snow! Seeing Puffy in the snow reminded me of the last time we had a bigger snow like this, which was in 2009. Puffy was only about a year old and had so much fun trying to catch snowflakes. I hope the last day of 2014 brings you many beautiful surprises! Buone Feste from the Amalfi Coast! We’ve been enjoying a quieter than usual Christmas this year, but full of gratitude that my husband is slowly recovering and feeling a little better each day. The weather has been unusually mild and gorgeous for December, yet as I write this a cold north wind is howling down the mountains. Winter has arrived! Looking back at these photos I quickly shot on my iPhone earlier this week on a sunny morning in Amalfi makes me feel a little warmer. Just a little. 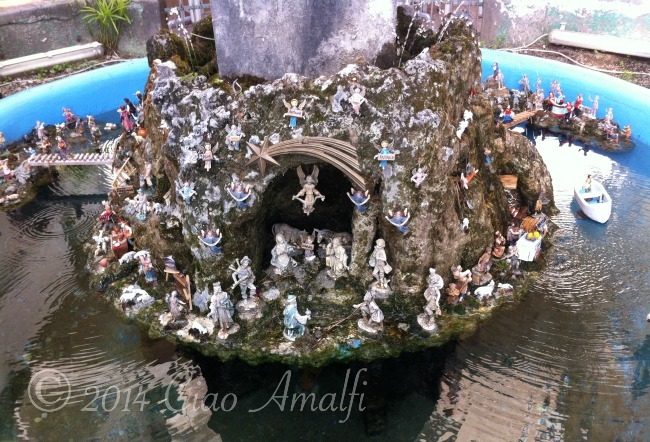 I love the presepi, or nativities, that are built in the fountains in Amalfi. Their intricate scenes are a mix of Neapolitan traditions and local touches, especially the one pictures above. As you walk around the fountain you’ll find familiar names for restaurants, cafés, a gelato cart, boats and even recognizable people! 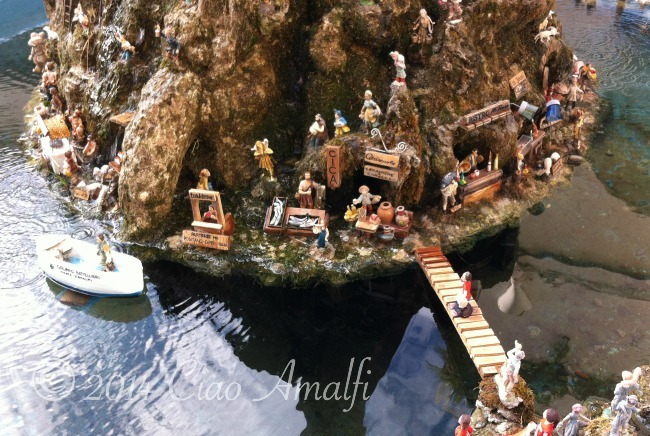 A lot of work goes into the creation of this presepe each year, starting with fishing out the turtles who usually laze about in the sun there the rest of the year. 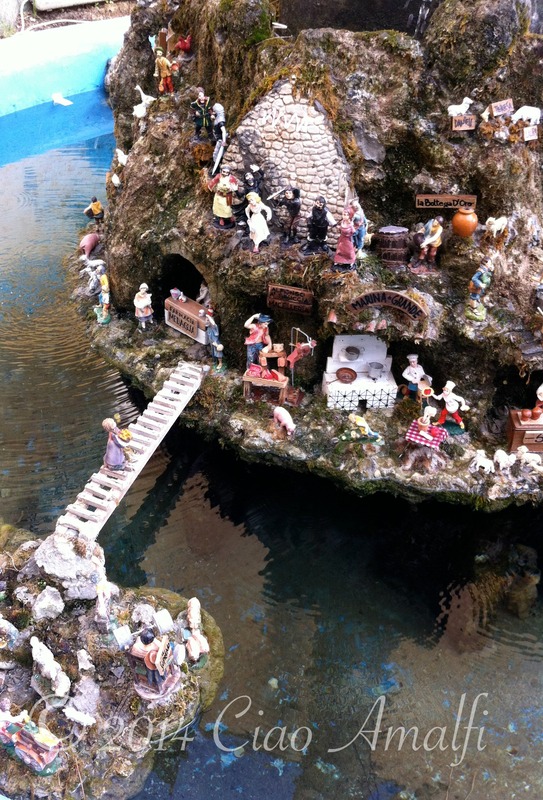 Most families also have nativity scenes in their homes, ranging from simple to hugely elaborate affairs complete with water features (but usually without the need to move turtles). I hope that you are enjoying a happy holiday time and are finding moments to enjoy the traditions and beauty of the season. 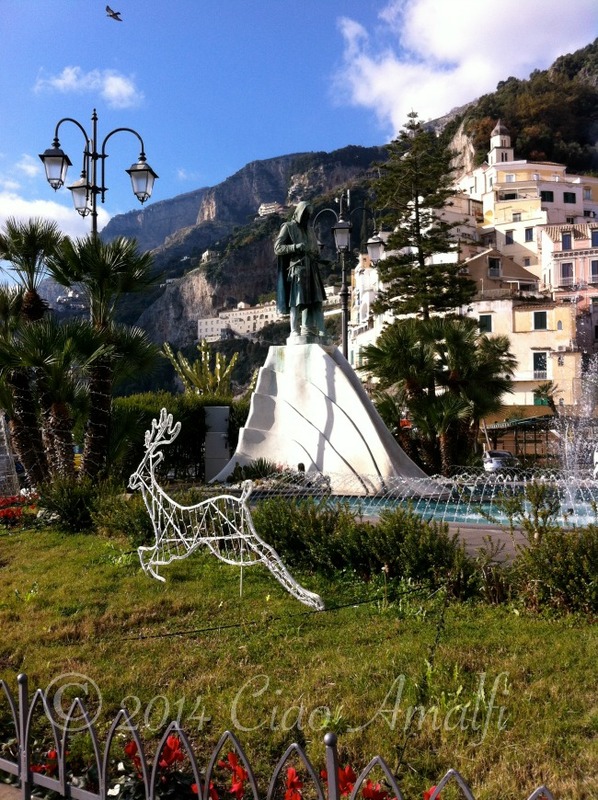 From the Amalfi Coast to you … buone feste! The holiday season has arrived in Amalfi! The Christmas decorations are simple this year, but they add a bit of a festive touch to the town. The shop windows of the pasticcerie, or pastry shops, are always the most colorful and tempting. I stopped in Pasticceria Pansa right in Piazza Duomo the other day to get some of their torroncini, one of our favorite Christmas desserts. They’re a nougat with almonds that’s scented with cinnamon and covered with Pansa’s deep, dark chocolate. Fabulous! 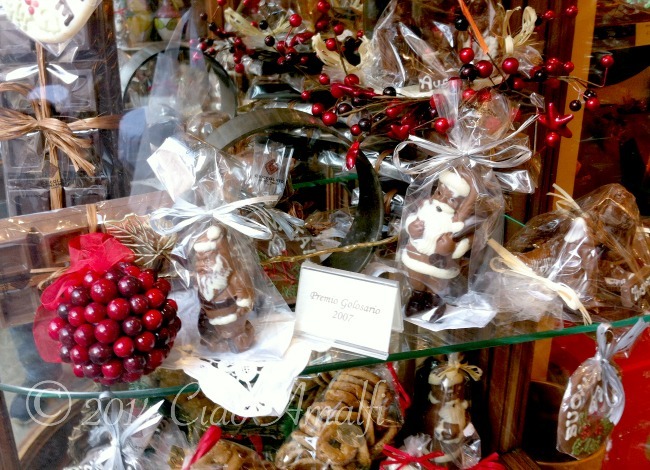 They produce a host of seasonal cookies, biscuits as well as various types of panettone, too. 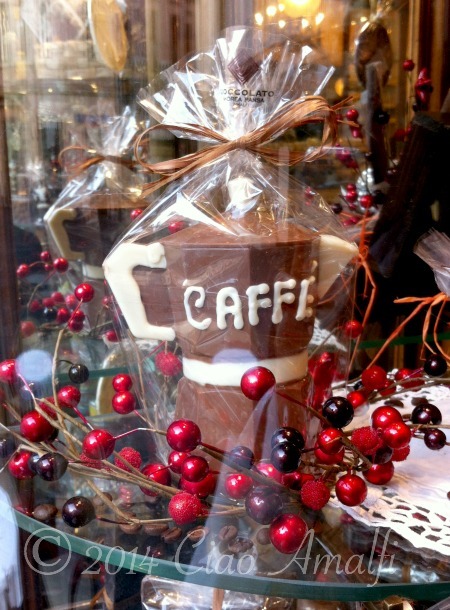 A chocolate moka pot – perfect for those chocolate lovers in your life! 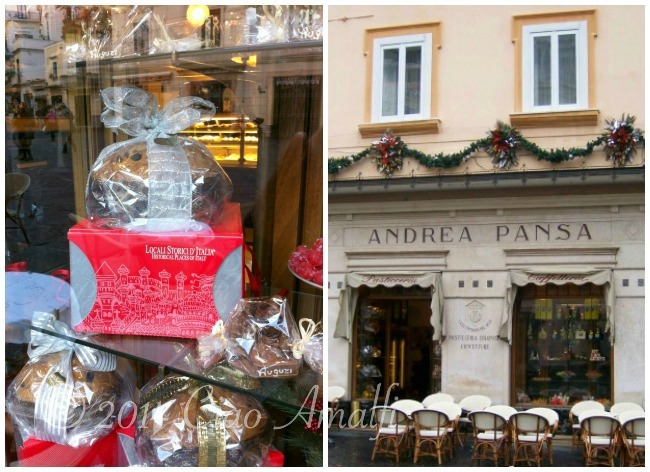 Pansa has an artisan chocolate production right in Amalfi and they create all kinds of treats for the holidays. I got a kick out of the different and fun shapes on display in the windows. 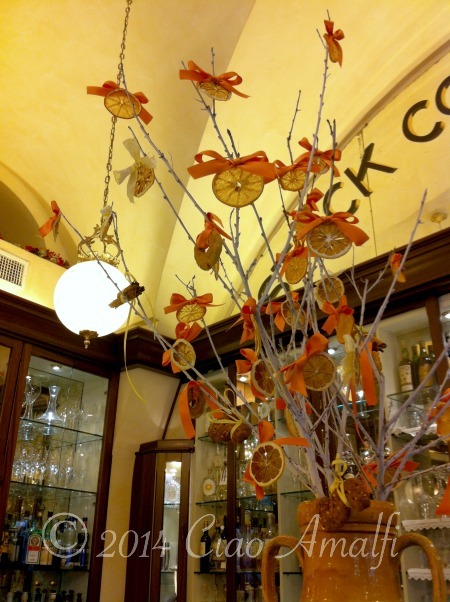 Inside they had a unique display made of branches decorated with candied orange and lemon slices, cinnamon sticks and even their esse di miele and roccocò cookies – both traditional sweets eaten after Christmas lunch. If you simply can’t resist, Pasticceria Pansa does ship all around the world! 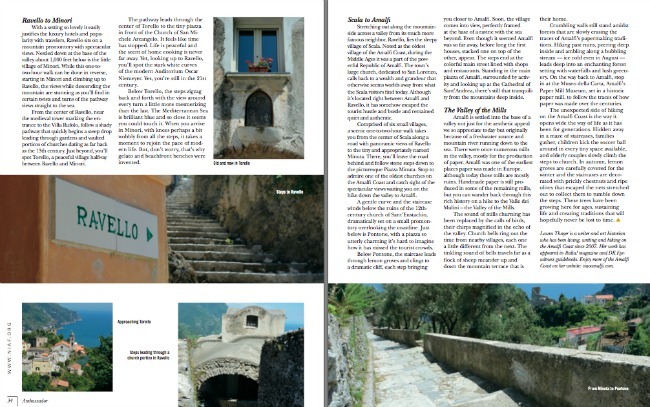 This summer I had the pleasure to write about one of my favorite pastimes on the Amalfi Coast — walking and exploring the ancient pathways and hiking trails — for the NIAF Ambassador magazine. 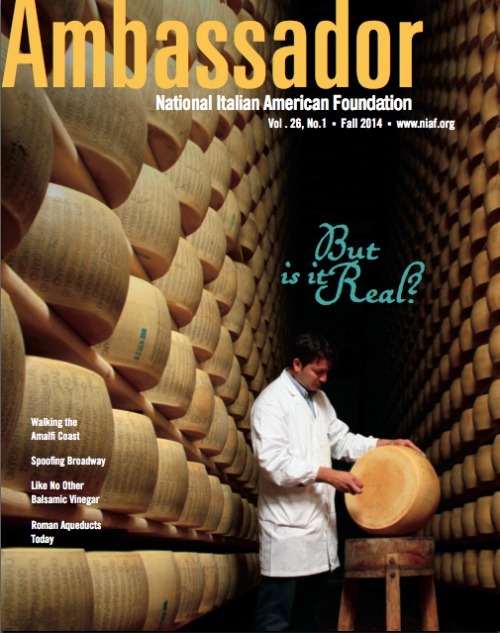 This is this quarterly magazine for the National Italian American Foundation, which is a wonderful resource for all things Italy. It was a joy this autumn to virtually flip through the magazine feature and to see my photographs across so many pages! 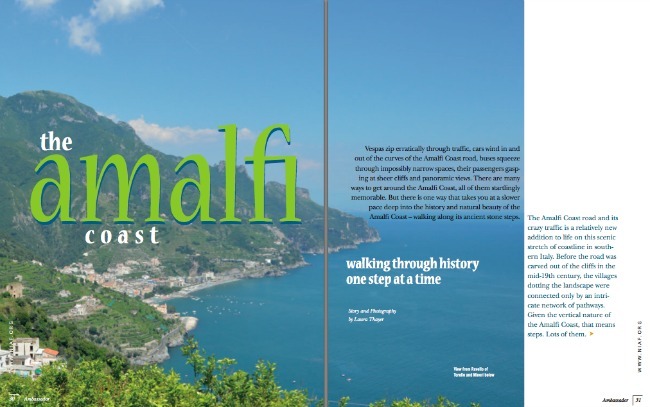 If you’re a NIAF member then you’ve likely already read through three of my favorite walks on the Amalfi Coast. If you’re not a member but would like to find out more, visit the NIAF website for all the details. A huge grazie to Michelle from Bleeding Espresso for the very kind recommendation for this writing project! Over the coming weeks I’ll share more of the photos of the different walks that I took while doing some of the most pleasurable research I’ve ever done. 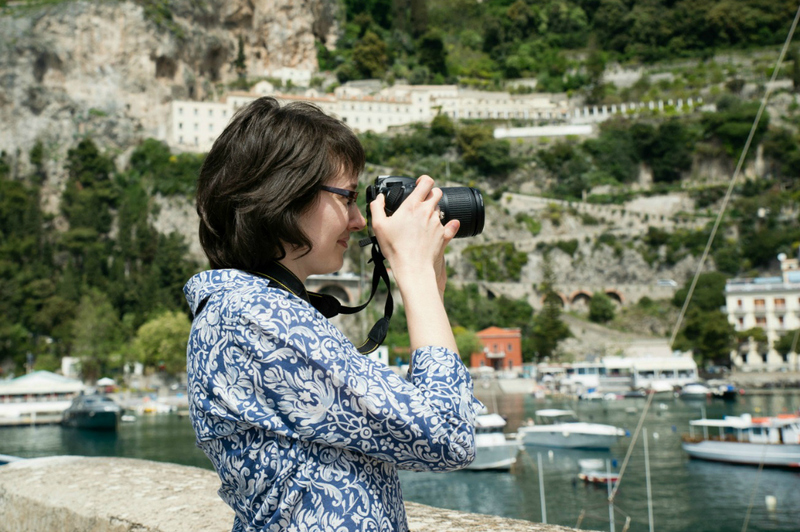 Stay tuned to the Ambassador magazine winter issue for an article about my two favorite spots on Capri. You will be tempted … oh so tempted! I squeezed out of the narrow opening of the car door into the wind, grabbing on to the railing to step up to a big ledge just centimeters from the edge of the car. We had found a parking spot in front of the hospital in Castiglione, and when such a good parking spot is found one climbs over seats, squeezes out and smiles. Wow, a parking spot! I glanced quickly down at the choppy sea before running around the car and helping my husband out. It was his first outing in a month and a half. I had hoped for better weather for him, but at least it wasn’t raining. The strong scirocco wind was warm and had whipped the sea up overnight. After a positive visit with the physiatrist, we piled back into the car to head home. 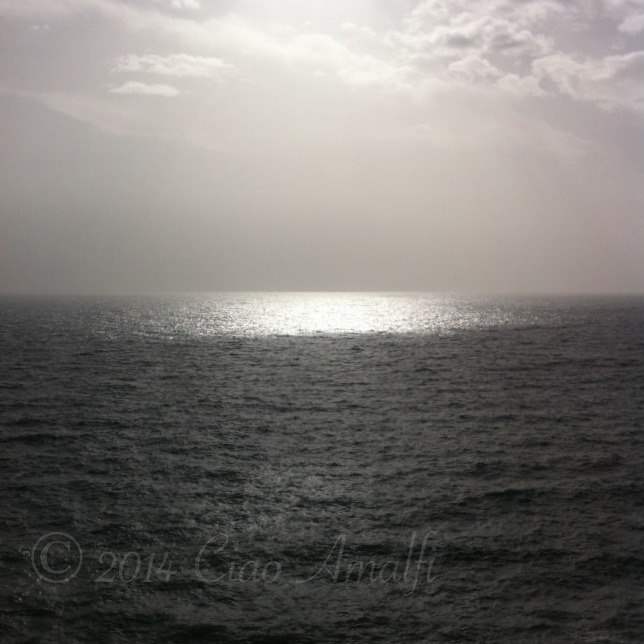 I took a deep breath of salty air and noticed a patch of sunshine had burst through the clouds. Life has been a bit rough lately, but my husband is recovering and there’s definitely sunshine.